Nobel laureate Prof Muhammad Yunus last night explicitly said he is not willing to become the chief adviser to the caretaker government, putting a brewing rumour of last few months to rest. "The caretaker chief should be neutral. I am not a neutral person since I am involved with the campaign for clean and competent candidates in the national elections," he said. If need be, he will form a political party to strengthen the campaign, the microcredit guru told reporters at Zia International Airport before flying to South Korea, where he will receive Seoul Peace Prize 2006. There has been a suggestion that the campaign for clean and competent candidates will not be successful without being a part of a political process. "Is it a tough job to form a party?" he posed a question. But he admitted he did not even think of joining politics before. The campaign for clean and competent candidates is the outcome of a long process and it should be moved forward, he asserted. The election will be meaningless unless honest candidates are elected, he said, adding that there is a need for the country to have an alternative politics. The country is caught in a political maze and people are looking for an option as a result, observed Yunus. "We need to break out of this maze." "I am not saying that I will be successful. But, the effort should be on," he said. However, he hopes the dialogue between Awami League and BNP will be successful. "The crisis is not that grave as it seems." 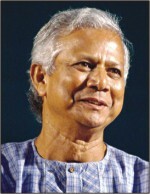 Prof Yunus received over 60 national and international awards before winning the Nobel Peace Prize 2006. The South Korean president will attend the prize-giving ceremony of prestigious Seoul Peace Prize. From South Korea Prof Yunus will go to China to join an international conference on micro-credit. He will also visit Japan to attend the annual meeting of UN Foundation. Last year, the meeting took place in Dhaka where Cable News Network (CNN) boss Ted Turner was present. The Nobel laureate will return home on October 31. Meanwhile, Pakistan Prime Minister Shaukat Aziz has congratulated Prof Muhammad Yunus on winning the Nobel Peace Prize 2006. He said it is a befitting recognition of the innovative banking concepts and the remarkable services rendered by Prof Yunus in alleviating poverty not only in Bangladesh but also in many other developing and developed countries, according to a message received in Dhaka yesterday. Extending heartiest felicitations to the Nobel hero, the Pak premier said the prize is an honour not only for Prof Yunus and Bangladesh but also for the entire developing world. He said the innovative methods of micro-credit introduced by Prof Yunus have helped millions of people across the world pull themselves out of the vicious circle of poverty on self-help basis. Shaukat Aziz said Pakistan has benefited tremendously from the Grameen Model. "I am personally grateful to Prof Yunus for his constant help in introducing micro-credit in Pakistan," he added.